This particular photo from the collection shows City’s player/manager Bobby Saxton acknowledging the supporters at the end of the triumphant 76/77 season. 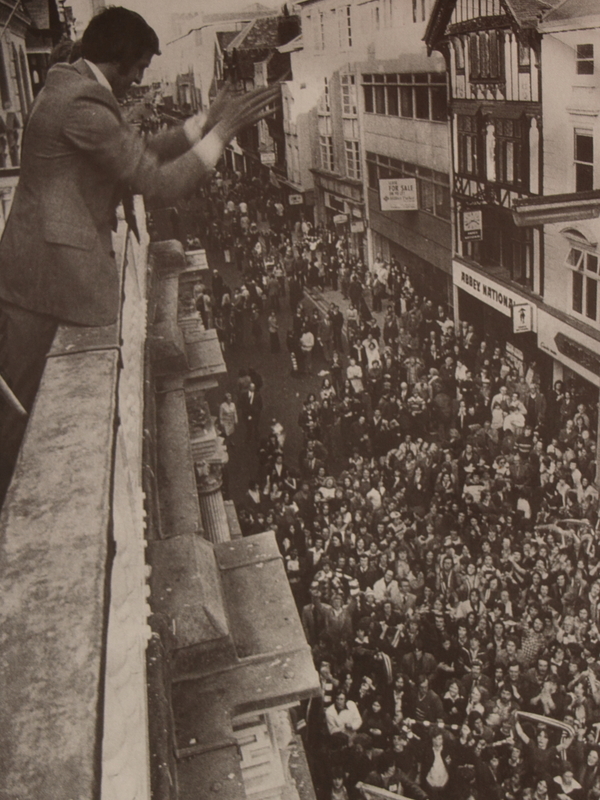 Here a crowd of over 2000 fans have gathered outside Exeter’s Guildhall to join in the celebrations, after the second promotion in the club’s history. With a resounding 3-0 win in the final game against Aldershot, City ended the season as runners-up, the first time that they had achieved a second place finish since 1933. Despite losing manager John Newman to Grimsby Town earlier in the season (in the pursuit of promotion! ), Saxton took over and within four months had guided the team up a division with an amazing run of results. In the last 14 league fixtures the Grecians lost only one match, at one point turning round a 3-0 half-time deficit to Barnsley to win 4-3! 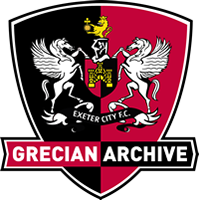 The players rightly celebrated in style, first joining the fans in the stands, before being invited to a civil ceremony by the Mayor of Exeter, where the players’ open top bus was mobbed amidst deafening cheers, songs and chants!